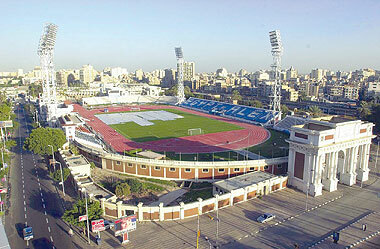 Alexandria Stadium (Arabic: إستاد الأسكندرية‎) is a multi-purpose stadium in Alexandria, Egypt. It is currently used mostly for football matches, and was used for the 2006 African Cup of Nations. The stadium is the oldest stadium in Egypt and Africa, being built in 1929. The stadium holds 20,000 people after recent remodelings. Wikimedia Commons has media related to Alexandria Stadium. This article about an Egyptian sports venue is a stub. You can help Wikipedia by expanding it.